The Stature’s 4-point cradle enables the carer to position the patient perfectly, simply by rotating the cradle (and patient) into either a fully seated or reclined orientation. This flexibility ensures the patient is comfortably transferred and requires little or no additional re-positioning. 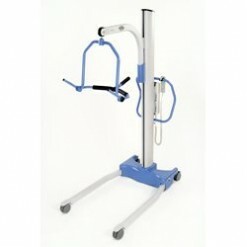 With Oxford’s unique ‘Securiz’ sling attachment system, you can be assured that patient safety is not compromised. The Secuiriz system ensures that no inadvertent detachment occurs, once the sling clip has been attached to the cradle. This guarantees that each transfer will be achieved safely and efficiently-100% of the time. Like all Oxford Pro passive lifting products, you have the option to choose whichever cradle or spreader bar configuration best suits the needs of the care environment and patient alike. With a wide selection of slings and attachments available, you can be sure to get the right combination each and every time.